0 Bytes used for 14 links? Why? It's unfair... that's why 70/70 is quickly done and it's stupid limit. And you need to work on English, because you have mistakes. 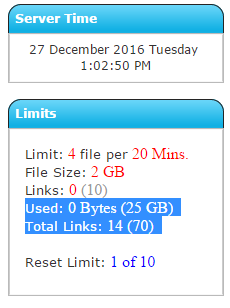 We can upgrade the 70 link limit..
Limit: 4 file per 10 Mins.